As a visitor to Beijing last week, it struck me that it is rather late in the day to crack down on western influence. The Chinese capital is the home to every western brand you can think of — from Lamborghini to Hooters. In the cafés near Beijing’s university campuses, Chinese students gossip and surf the internet, much like their western counterparts. Yet apparent familiarity can be deceptive. Logging in from my hotel, I was naively surprised to run straight into the great firewall of China that blocks access to Google, Twitter and many other sites. In recent months, the great firewall has been raised higher amid a crackdown on western influence that has affected universities, bloggers and television schedules. People directly involved in liberal politics have suffered much more directly. Human rights organisations say that hundreds of activists have been detained over the past year. Foreign non-governmental organisations are also under intensified scrutiny and pressure. This crackdown points to a surprising sense of insecurity in China’s ruling circles. Events in the outside world have made the government increasingly anxious about the threat of a “colour revolution” that would challenge the Communist party’s grip on power. 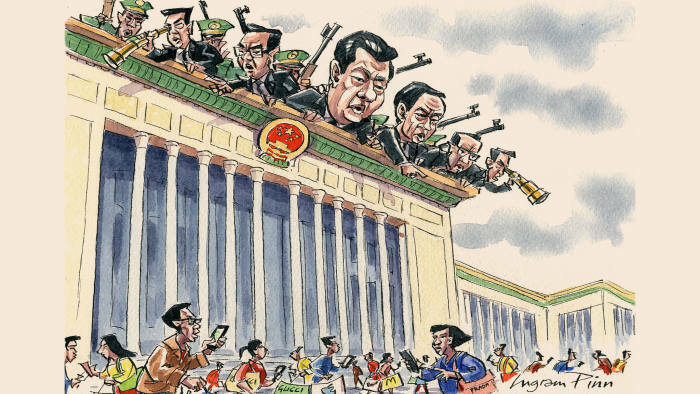 That links to anxiety about the internal stability of China, at a time when the economy is slowing and President Xi Jinping’s anti-corruption campaign is creating discontent among the ruling elite. The wave of revolutions in the Arab world stirred deep anxieties in the Chinese Communist party about popular risings against undemocratic governments — and the chaos they can unleash. The role of western institutions and technology in stoking these revolts was noted in Beijing. The fact that the Egyptian uprising of 2011 was labelled the “Facebook revolution” and that one of its most prominent early activists was a Google executive helped to seal the fate of those two companies in China. Over the past year, Chinese official paranoia about the threat of a colour revolution has been stoked by events in Ukraine and, above all, Hong Kong. China seems to have sincerely embraced the Russian view of the uprising in Ukraine, namely that it was essentially organised by the Americans, using all their nefarious tools, from the internet to NGOs. In April, months before the protests in Hong Kong broke out, Wang Jisi, a prominent Chinese academic, wrote that the main concern of Beijing’s leaders in dealing with America is “alleged US schemes to subvert the Chinese government and to penetrate politically and ideologically into Chinese society”. The Hong Kong protests, which broke out in September, seemed to confirm Beijing’s deepest fears. Viewed from China, they looked dangerously like the arrival of the techniques of the colour revolution within China’s own borders: the sit-down protests, the students, the foreign television crews, the use of social media and the emergence of a catchy brand name, the “umbrella movement”. The Chinese government succeeded in damping down the protests in Hong Kong. But some in Beijing claim to see a sinister pattern of western meddling — stretching from the Arab world to Ukraine, Cuba, Venezuela and now Hong Kong. What is more, all this international disorder is coming at a time of heightened political tension within China. Mr Xi’s trademark domestic political initiative is his anti-corruption campaign. This has gone on longer and struck deeper than many expected. The anti-corruption drive is said to be popular among ordinary Chinese. But it is threatening powerful interests. In the past couple of months, the government has formally charged Zhou Yongkang, the former head of China’s internal security police and announced an investigation into Ling Jihua, who was the senior aide to Hu Jintao, Mr Xi’s predecessor. There is also said to be discontent in the massed ranks of party officials, many of whom have got used to supplementing their relatively meagre official salaries with bribes. Some even argue that the slowing of China’s economy has something to do with the chilling effect that the anti-corruption campaign has had on business deals. It may be that Mr Xi is so perfectly in control of the political system that he can afford to take on powerful interest groups. But well-connected people in Beijing now speculate openly about the possibility of an attempt to remove the president. Some note that previous bouts of popular unrest in China, for example in 1989, coincided with divisions at the top of the Communist party.